On Aug. 5, a 6.9-magnitude earthquake ruptured the northern reaches of the Indonesian island of Lombok, killing at least 319 people, displacing more than 160,000, destroying tens of thousands of homes, and burying villagers beneath the rubble of mosques and other structures. The disaster struck exactly one week after a foreshock clocked in with a strength of 6.4-magnitude and left 20 people dead. Lombok, which is especially popular among tourists visiting the tropical Gili Islands off its northwestern coast, lies in the center of the Indonesian archipelago, where thousands of volcano-pocked isles mark the western periphery of the Pacific Ring of Fire. This horseshoe-shaped strip curves loosely from the waters east of Australia, over maritime Southeast Asia, up the coasts of China and Russia, and down the west coast of the Americas from Alaska to Chile. Roughly 81% of the most powerful earthquakes ever recorded happened along this volatile rim. The Lombok earthquakes, while disastrous, were nowhere near as destructive as some of Asia’s earlier shocks. But scenes of villagers in mourning, rescuers scrambling through debris, hordes of tourists crowded on a beach, desperate to escape their idyllic destination — all serve as a reminder that this region of the world is a hotbed of seismic activity that can quickly turn tragic. With cities, dams and other infrastructure built atop some of the world’s most active faults, six of the ten deadliest quakes in recorded history happened in Asia, as did many of the most costly. Here’s a look at back at some of the most devastating temblors ever to strike the continent. More than 830,000 people died in the days after Jan. 23, 1556, when central China was struck by the deadliest earthquake ever recorded. With an epicenter in the Wei River Valley, the 8-magnitude quake reverberated throughout 10 provinces — even damaging buildings in cities hundreds of miles away. It may have killed about 60% of the population in some of the worst hit counties. The horrific death toll is largely due to the collapse of several cliffs in the Loess Plateau, where many people lived in “house caves” called yaodongs. These traditional hillside dwellings, carved into the earth to create temperate caverns, crumbled to dust as the mountains shook. 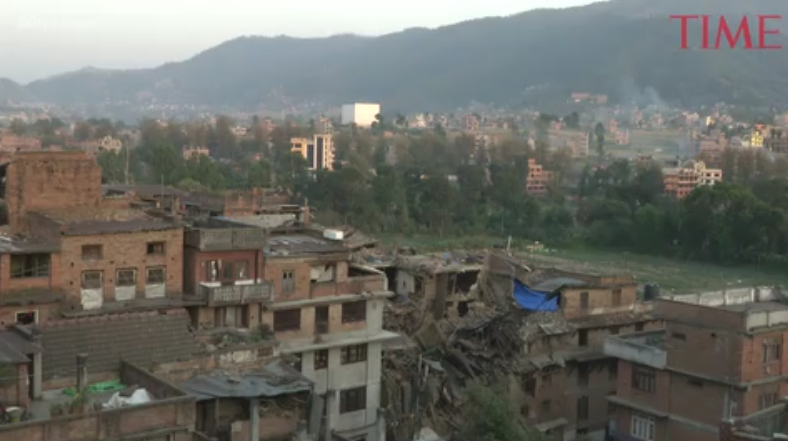 Landslides wiped away entire settlements. The rupture is often referred to as the “Jiajing Great Earthquake,” a reference to the eponymous emperor of the Ming Dynasty who ruled at the time. It would be impossible to calculate the damage by modern monetary values, but its cost of human life is unmatched. Another devastating temblor struck the neighboring province of Ningxia in 1920, however, killing more than 200,000 people and making it among China’s deadliest disasters. Some six miles south of Mount Everest, the earth began to rumble on the afternoon of Jan. 15, 1934. Little was left in the wake of Nepal’s worst recorded earthquake, a powerful 8.1-magnitude, that leveled most of three major cities in the Kathmandu Valley and tore through parts of North and Northeast India. An estimated 10,700 to 12,000 people were killed by the quake that severed hundreds of miles of terrain from Bihar to Assam. Surrounded by rubble near the Nepali capital, one structure remained remarkably intact: the Temple of Pashupati, the nation’s guardian deity, was reportedly untouched. Elsewhere, sand and water rose up from fissures in the ground, softening a 186-mile stretch of land to a soup now known as the “slump belt.” Some accounts describe buildings sinking down into the mud and floating away from their foundations. The disaster was chronicled in a book by Major General Brahma Shamsher titled The Great Earthquake of Nepal 1990 (the country’s calendar is 56 years ahead of Gregorian dates), reportedly first published in 1935. His compilation of first-hand accounts and unparalleled details about the Nepalese Army’s relief efforts were republished in the wake of Nepal’s devastating 2015 quake. Most of Tangshan was fast asleep when the world came crashing down around them. At 3:43 a.m. on July 28, 1976, the industrial city in northeastern China’s Hebei Province was struck by a 7.6-magnitude quake that wiped out more than a third of its entire population. The official death toll rests around 242,000, though by some estimates fatalities may have reached 655,000, according to the U.S. Geological Survey. The aftermath of the devastating earthquake of July 28, 1976 that hit Tangshan in the eastern part of Hebei Province, China. News of the event traveled slowly, and so did relief. Railroads, bridges and highways were rendered impassable, and survivors later recalled being trapped under mounds of bricks waiting to be saved. Roughly 80% of the buildings citywide were said to have been flattened or severely damaged; the extent of destruction largely attributed to Tangshan’s complete unpreparedness for catastrophe despite its being built directly atop a known active fault line. Seismic shifts were also taking place within the ruling Communist Party of China at the time disaster struck; just months prior, the death of Premier Zhou Enlai precipitated a leadership scramble as party Chairman Mao Zedong’s health deteriorated and his Cultural Revolution was in its last act. Mao died about six weeks after the earthquake, and his successor Hua Guofeng preemptively seized on the issue to consolidate support, reportedly making a personal visit in early August. They refused offers of aid from international organizations and launched a campaign entitled Resist the Earthquake, Rescue Ourselves. Doctors and soldiers were sent in from all over the country. Injured residents were evacuated, often to distant hospitals, while provincial governments sheltered thousands of orphaned children. Temporary shanties sprang up throughout the devastated city and beyond. An infant born on the day of the disaster was famously named Xiedang: Thank you, party. Nonetheless, the years that followed were beset by political rivalries that led to the downfall of the Maoist Gang of Four, the end of the Cultural Revolution and the resumption of power by reformist Deng Xiaopeng. The Tangshan earthquake was the subject of a 2006 novel by Zhang Ling titled Aftershock, later adapted to the silver screen by director Feng Xiaogang. The film’s revised narrative followed the lead characters’ lives several decades down the line, when another calamitous quake hit central China’s Sichuan Province. It had happened several times before, but the tremors of 1819 and 1956 paled in comparison to the 7.6-magnitude shock that felled swaths of the fast-growing state of Gujarat on Jan. 26, 2001. At least 20,000 people are believed to have died and hundreds of thousands of buildings destroyed in the strongest earthquake to strike the westernmost state of India in almost a century. The district of Bhuj was hardest hit, some 12 miles away from the epicenter. Nearby rural villages were reportedly completely flattened, and some believe the death toll to be higher than official estimates because it was common for some poor villagers to live their entire lives without ever being officially recognized by the government; no birth certificate, no identification card, no record of ever existing. TIME reported from the scene in the days after the quake that there was “no escaping stench of dead and burning flesh,” as bodies were quickly burned to prevent the spread of disease. The main road from the airport has a 12-inch gash in the middle, and every so often, the ground still heaves. Along the road, the remnants of houses lie broken. There are piles of chopped wood, in preparation for the mass cremation in the evening when more bodies have been pulled out of the rubble. People are living on the streets, the women inside makeshift enclosures of tied sheets or saris. A homeless family waits for a vehicle on Jan. 27, 2001 against a backdrop of ruined houses and a funeral pyre, in the village of Boundi in Bhuj district in Gujarat. Passersby look at a destroyed building on Jan. 29, 2001, where they used live in the town of Bhuj, in India's Gujarat state. Nineteen miles below sea level in the early hours of Dec. 26, 2004, a 9.1-magnitude earthquake shook the seas near the coast of Sumatra, in the northwestern reaches of the Indonesian archipelago. Over the days that followed, shockwaves caused by the quake slammed into shorelines as far afield as South Africa, some 5,300 miles away. Fishermen manning their boats in the waters near Indonesia, Thailand, Malaysia, Sri Lanka and elsewhere saw the tides being sucked into the sea. Not long after, waves as high as 100 feet overhead came rushing toward the coastlines, turning cities into swamps full of corpses and sodden debris. At first, Bustami saw water retreat from shore, with fish jumping around on the empty beaches. Then, he says, “I heard this strange thunderous sound from somewhere, a sound I’d never heard before. I thought it was the sound of bombs.” The water rose behind him as high as the coconut trees on the shoreline, and he was thrown off his boat. “It felt like doomsday,” says Bustami, who, after clinging to a coconut tree, was eventually picked up by a soldier three hours later, almost 2 miles away from where he had lost his boat. No other tsunami in recorded history was as deadly, with victims from all over the world counted among the casualties. Waves wiped out villages, cities, luxury getaways, schools and hospitals. Survivors clung to palm trees as sweeping floodwaters rushed past full of broken glass, car parts and corpses. When the waters slowed and receded, survivors and rescuers trudged through the waterlogged wreckage sometimes to find they were standing on top of dead bodies. Mangroves, coral reefs and marine life were wrecked, leaving a lasting mark on the environment and regional economies. But the legacy of the tsunami transcended its path of destruction. Governments throughout the world pooled together some $14 billion in aid for affected regions. Shorelines rebuilt in the following years were marked with warnings, signs pointing to pathways toward higher ground, and an Indian Ocean Tsunami Warning System came online in 2006. “I didn’t know what a tsunami was… nobody did,” a survivor in the Thai resort town of Khao Lak told TIME ten years later. Today, they know. A decade on, the earthquake that rocked China’s Sichuan province on May 12, 2008, still looms large in the nation’s memory. While the 7.9-magnitude earthquake didn’t break records in terms of its strength, it left behind a devastating impact on the loss of human life and a prolonged aftermath. More than 87,000 people were reported killed and missing, as well as 4.8 million rendered homeless from the quake’s destruction. In terms of economic losses, the quake was the second highest in absolute numbers in history, and was one of the few instances in recent history where China requested international aid and assistance to help with the mammoth recovery effort, with an estimated $137.5 billion spent on rebuilding the affected areas. As the Chinese government responded to the disaster under international media scrutiny, questions surfaced about the poor infrastructure in the affected region. According to UNICEF, more than 18,000 schools across Sichuan and neighboring Gansu province were damaged as the earthquake struck in the afternoon on a school day, killing thousands of children. Allegations quickly arose that shoddy construction was to blame for the quake’s effect on schools, and that corrupt local officials had permitted the neglect of building safety regulations. Scientists have also suggested that a nearby hydropower dam may have affected the timing and intensity of the quake through a phenomenon known as Reservoir-Induced Seismicity. Official counts were not released until one year on from the quake, placing the number of student deaths at 5,335. However, parents and activists disputed its accuracy, arguing that the figure was closer to 10,000. The tenth anniversary of the tragedy was marked earlier this year, with reports suggesting that the Chinese government highlighted more positive repercussions of the quake, such as praising the army’s response and the spirit of the volunteers that aided the recovery effort. But the impact of the earthquake in Sichuan and beyond is still profound, particularly for the parents still searching for answers and the survivors of the disaster. A magnitude 9.0 earthquake struck Japan’s northeastern coast and Tōhoku region on March 11, 2011, triggering a tsunami with catastrophic consequences. It was the fifth-largest quake in the world since 1900, and its power even impacted the earth’s gravitational field, rattling a satellite orbiting at the outer edge of Earth’s atmosphere. The quake caused a tsunami which slammed Japan’s coastline with waves of more than 32 feet high, and travelled some 6.2 miles inland. Nearly 20,000 people were confirmed dead and 2,500 missing in the disaster. A third crisis erupted when the pressure levels at the region’s Fukushima nuclear power plant reached much higher than normal due to the forces of the tsunami waves. In the days following the quake, explosions at the plant led to the release of radiation in the surrounding areas and mass evacuations. In April, the crisis at Fukushima was raised to a level 7 disaster on the International Nuclear Event Scale, joining only one other event in this category: the 1986 disaster at the Chernobyl plant in the former Soviet Union. …the country’s struggle between its technological heart and natural soul continues. Brave workers are racing to limit the dangers from the radiation-spewing Fukushima Daiichi nuclear power plant, which was damaged by the natural disaster. Farmers near the radiation zone have been forced to dump tainted milk and produce. And fishermen can no longer depend on the ocean’s generosity since their boats were smashed into splinters. The disaster remains the costliest earthquake in the world, with material damage estimated at about $300 billion according to CNN. More than 70,000 people remain displaced from their communities seven years on from the triple tragedy. Tokyo will play host to the 2020 Olympics, and the event’s organizing committee announced last month that the traditional Olympic torch relay will start from Fukushima to mark the events of 2011 and showcase the region’s recovery. It was no secret that Nepal was vulnerable to deadly disaster, and the 7.8-magnitude quake that struck near the district of Lamjung on April 24, 2015, proved decades of warnings tragically prescient. For about 50 seconds, the ground shook intensely and brought buildings tumbling down across the impoverished Himalayan countryside and through the heart of the capital. Then came the aftershocks. A 6.9-magnitude tremor the following day triggered a landslide on nearby Mount Everest, killing 21 people in the single deadliest day on the world’s highest mountain. More than 150 others died when a second earthquake struck along the very same fault line on May 12, while rescuers were still trying to deliver assistance to those affected by the initial shock. Nearly 9,000 people were killed in the disaster, and millions were made homeless in an instant. The remote locations of the hardest hit areas made rescue and relief operations extremely difficult, while most of those affected were already poor rural villagers with few services and little to no infrastructure. A multinational relief effort was launched to assist Nepal, one of the poorest countries in Asia, with the gargantuan task of locating affected populations and providing medical assistance and clean water as the risk of infectious disease loomed large. But reconstruction proved the most difficult task in a country with low GDP, poor infrastructure and an inefficient bureaucracy; total damages have been estimated at 7 to 10 billion dollars. One year after the quake, TIME visited the still devastated district of Sindhupalchok, finding little progress had been made. Ram Giri, a truck driver who lost his home and his job to the crisis, described his life in the wake of the catastrophe. The only work left for him, he said at the time, was a bit of manual labor here and there.